Each year we plant a vegetable garden, mostly tomatoes, squash, beans and herbs. This last weekend we began readying the raised beds and planting some of the vegetables. Some things come back on their own. This is the third year for the rhubarb and it's doing well. I'm looking forward to making strawberry rhubarb jam and a deliciously sweet rhubarb coffee cake. 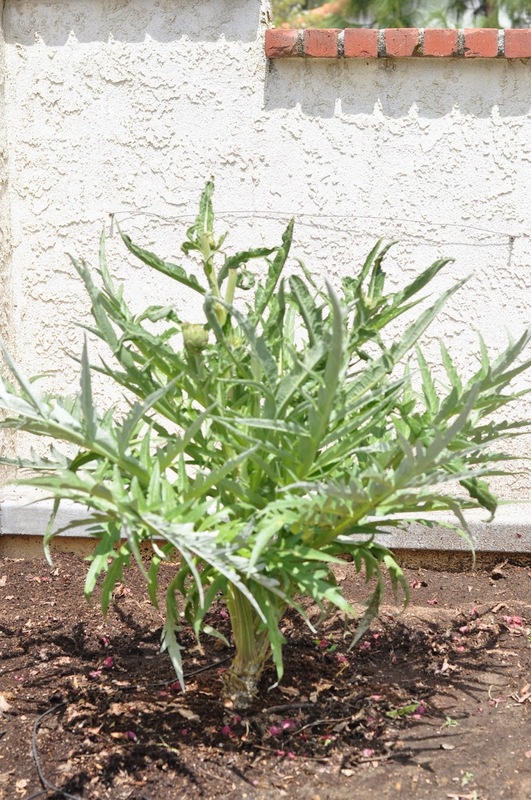 It's the second year for this artichoke plant and we have already been eating artichokes for weeks. I cleaned out all the dead leaves and debri that had collected under the plant making it look kind of whimpy, now. But it's super healthy and has few bugs, which is a plus. Artichokes are just so pretty, aren't they? We didn't do much with the raised beds in the winter or early spring so there was a lot of weeding and nutrient replacement needing to be done. My man power and I ran out of steam, so this job will be continued over the next week. 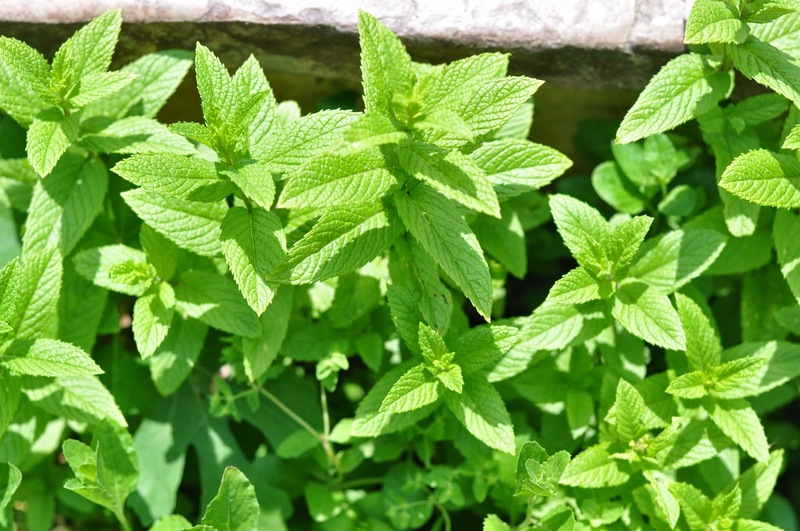 and so does the mint. They are a nice refreshing drink to whip up in the afternoon after a hot day working in the garden. 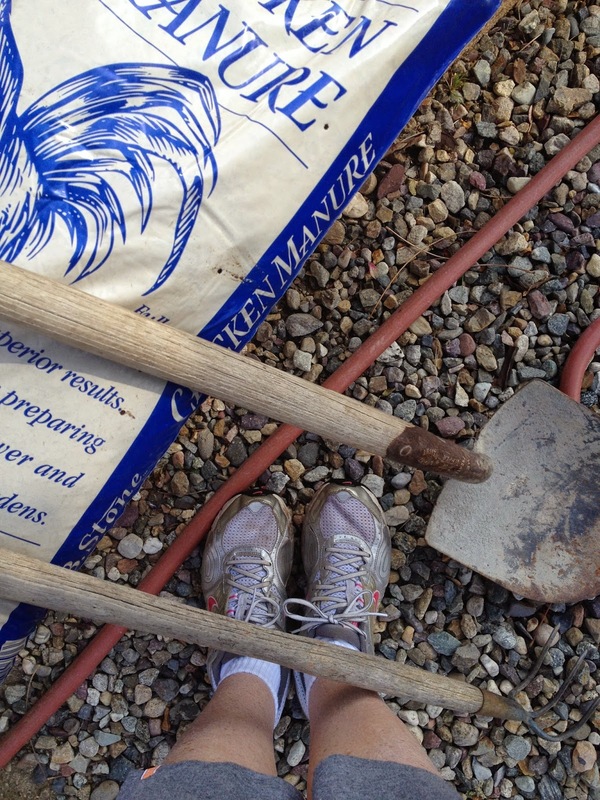 This is one of my favorite garden tools. This garden wagon was a gift several years ago and I love that it is all rusty and still works great for hauling things from the car to the backyard. We went to our favorite nursery, Roger's Garden in Corona del Mar, and bought all the starter plants. I usually have a contest with #2 son to see who can grow the biggest tomato. This year, Paul went to the nursery with me and we spoke with David, a wealth of knowledge about tomato gardening. He said to try Big Zac...it's supposed to produce a fruit 4-6 pounds. Look out Michael, dad has a plan. He also saw a tomato called German Johnson...need I say more? He bought it just for the name. Boys never grow up! The Big Johnson tomato will be the talk of the garden when all the boys are here. 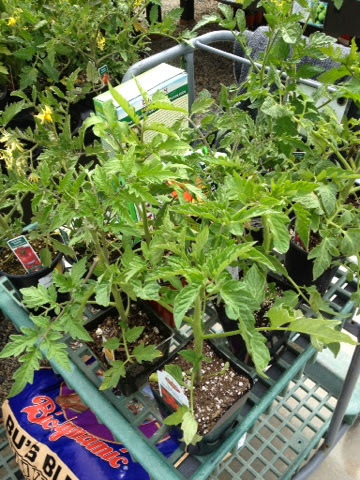 I usually buy all heirloom tomato plants, but this year we took David's advice and bought the ones he recommended. I transfered the herb garden to another raised bed because this one has become so full of roots. It will take a while to clean it out and replant it with something else. 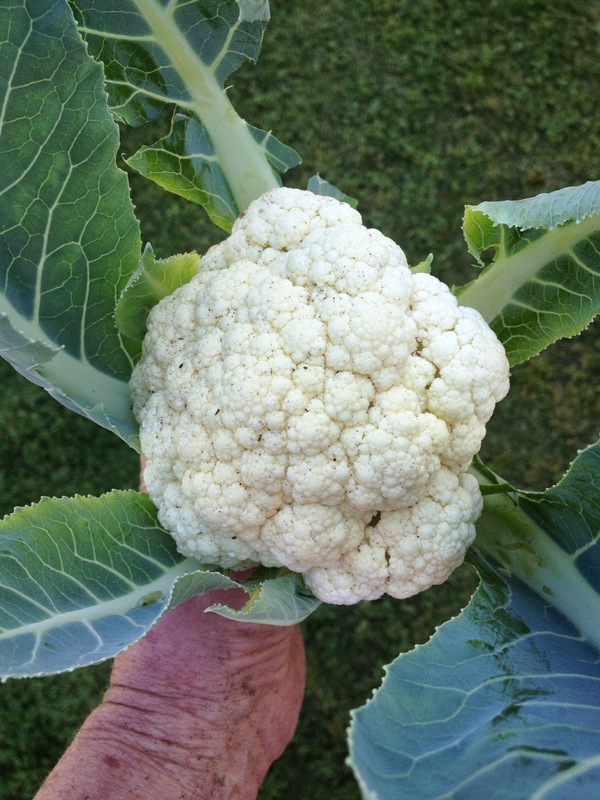 While cleaning out the old we found a baby cauliflower. Guess what I am having for lunch today? 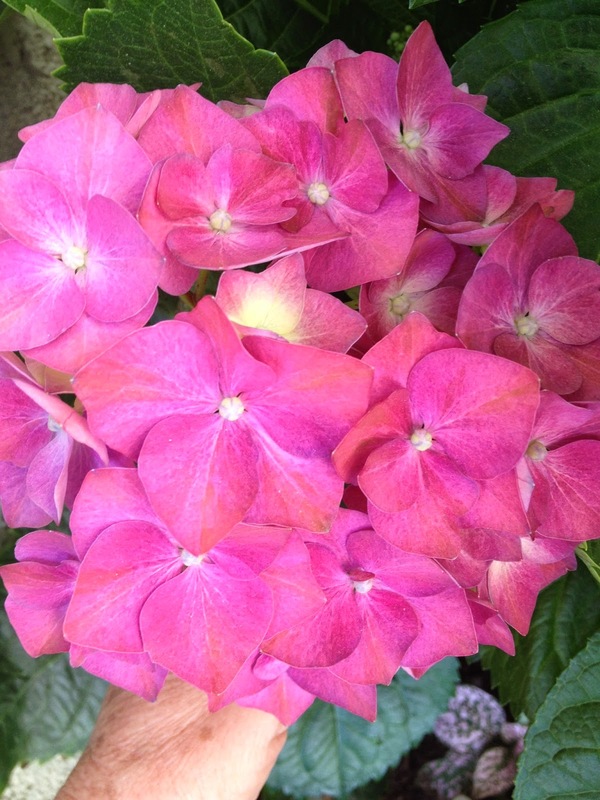 Our first hydrangea has bloomed and I can't wait for these huge blooms to fill the patio with color. 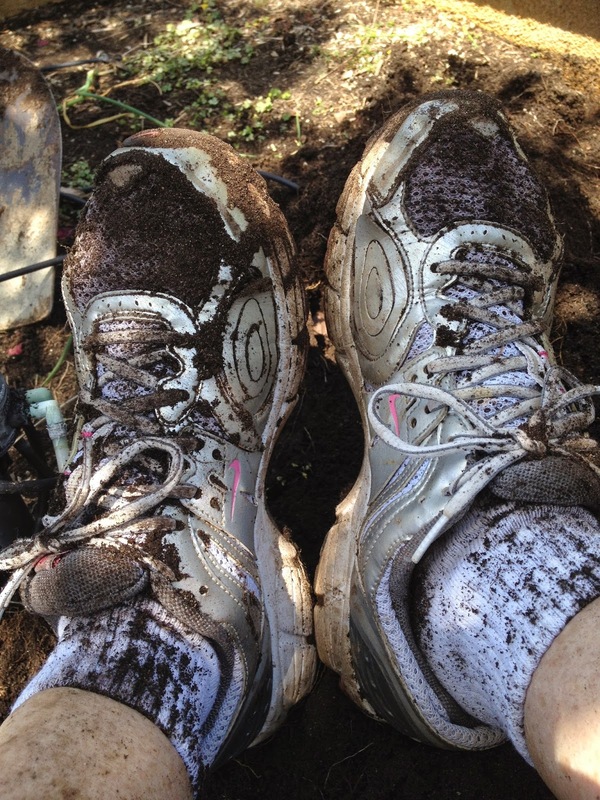 That's my garden prep story...I was covered in dirt and smelled like chives, even after a shower. It's a good feeling to get down and dirty and to know that we are growing our own food. What a difference latitude makes! Our snow is only just starting to melt and we're 2 months or more away from being able to start tomatoes. It's a short growing season here in Newfoundland. It was fun touring your garden with you. So cool Di! Love that cart!! I wish I had your ability to grow things. 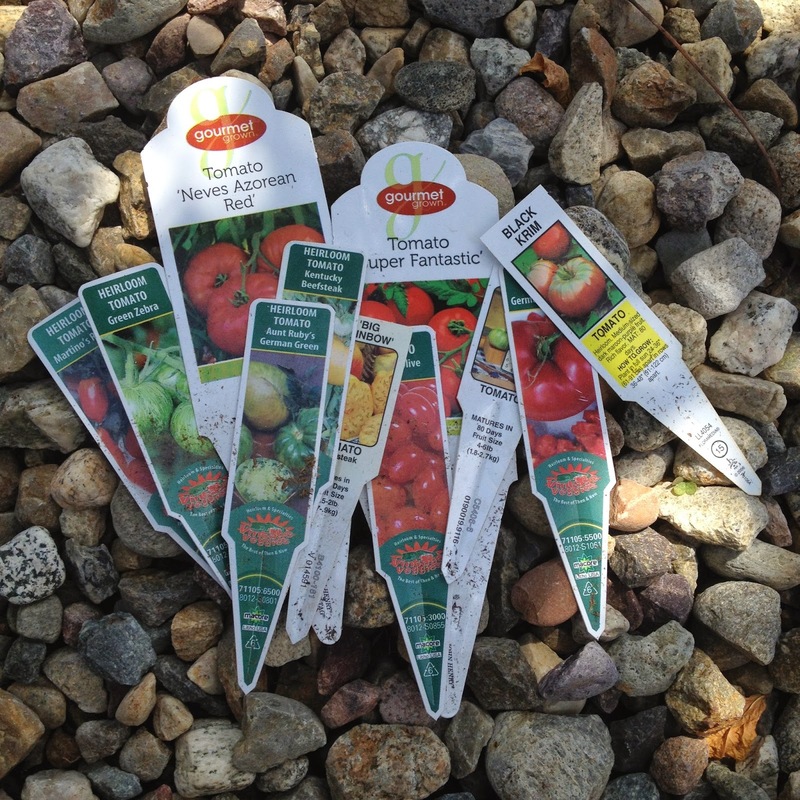 Loving the tomato names but cannot imagine a tomato that is 4-6 lbs! I love your garden! I am catching up reading, your clamshell is beautiful too. Your raised beds are fabulous….think I need to get me some! I would guess that you are about 3 months ahead of us!!! I'm definitely jealous of the fact that you can grow limes (and other citrus fruit). I can't really do that here in Illinois. That's Roger's Garden is awesome! I went there once, while visiting my aunt. I think I could have wandered around looking at everything for the whole day!